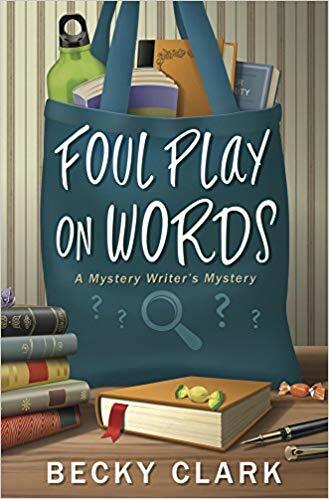 Foul Play on Words is a cozy mystery set at a writer’s conference with dogs and a possible kidnapping on the side. Charlee, a mystery writer, is forced to run a writer’s conference when her best friend, Liv, tells her she has to look for her daughter Hanna, who has been kidnapped. The conference is rather a mess what with double booking the conference rooms with a dog agility show and the recent firing of the chef that was providing the food. In addition, all the experienced volunteers are home sick with food poisoning from tasting the chef’s food. Maybe it is a good thing he was fired! As Charlee begins to whip the conference into shape, she gets pulled into Hanna’s disappearance. Charlee increasingly believes that Hanna has run off—rather than being kidnapped. At 21 years old, Hanna can basically do as she likes. I’m not sure why but Foul Play on Words didn’t enchant me the way I expected. It had a writer’s conference, a dog show, funny lines and a cozy mystery plot. However, it never seemed to come together into a coherent plot. But just because I didn’t like it doesn’t mean that you will not so I’ll give it 3 stars. Thanks to Midnight Ink and NetGalley for a copy in exchange for my honest review.